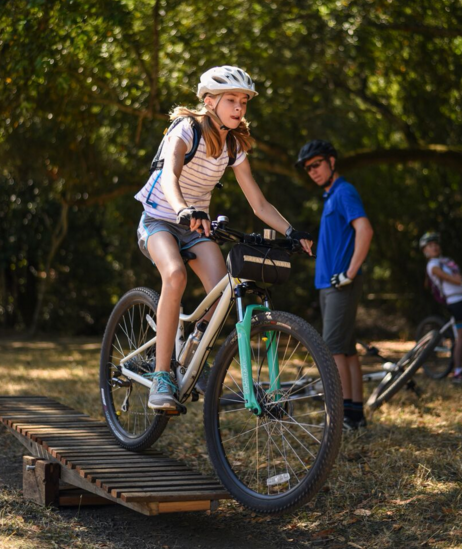 At Fairfax Cycling Camp, we are passionate about strengthening our girls, as we believe that strong girls grow into strong women who help make this world a better place. One of the ways girls grow into strong leaders is through experiences which challenge them just enough, yet allow them to feel successful as they connect with nature and their physical abilities. We also know, and extensive research supports that, sometimes girls especially thrive in an all-girl environment. We've seen girls ride in our advanced groups with boys and kill it, which we will still offer. We also have seen the incredible support, focus and camaraderie a group of girls can share with each other. We want girls who may be intimidated by a group of boys to feel welcome, and to know that special attention will be paid to their needs. We also take great care to hire awesome girl counselors to mentor and lead all of our campers! Our popular girls' groups is offered during Week 2 of summer camp.